a small glass candle holder and a candle. Alice, you drank that shrinking tonic and it made you feel "curiouser and curiouser"... oh, your head! But where are you? You are in a land of tiny things, and what is that on that tiny silver tea tray? 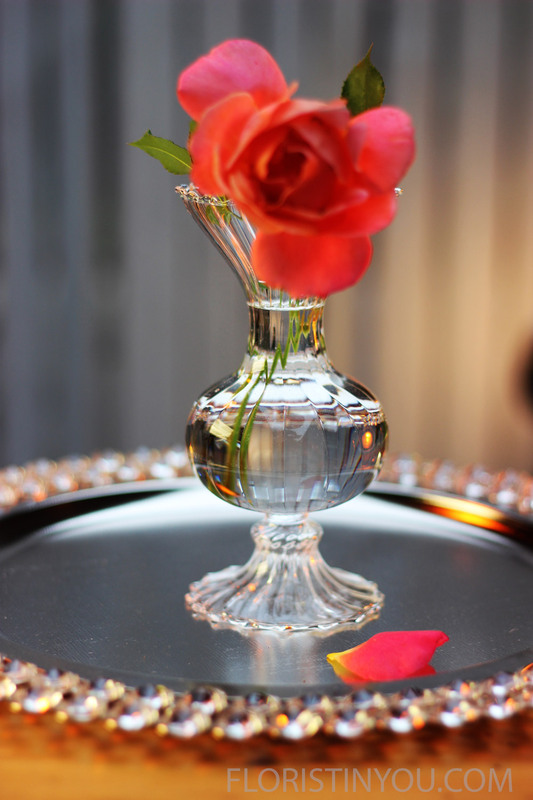 A collection of beautiful tiny bud vases with roses in them. What is a bud vase? Well, my dear, bud vases are tiny vases designed to hold one bloom or flower. They usually range from 4.25" - 8" in height, but they can be very much smaller. These bud vases, are all made from a very fine ribbed glass, and are extremely reflective. Their shapes and heights vary just a little from each other, but they are also similar. There are five bud vases here, but you could make an interesting grouping with just 3 vases. This tray is a silver colored tray, bejeweled around the edges. Grandma's silver tray would make a beautiful base as well. Even though these are single flowers in bud vases, because you are making a grouping of vases, it is like making an arrangement. Your shortest vases and buds will be placed in the front with the taller vases and blooms in the middle or back. Arrangements can be made to be viewed only from the front, or from the front and back as well. If you want it viewed from both sides, place the tallest blooms and vases in the middle, with a short vase and bloom in the front and in the back as well. The rabbit told me making this grouping is not hard. All it takes are a couple of snips. Do you have your pruning shears? Let's go. Here are the five bud vases of similar but different height and shape that you saw. Strip off thorns or break off with your thumb. Largest blooms in tallest vases. Put in back or mid. This regular sized bloom is good for the med. vase. Put medium sized vases between tallest & shortest. A short bloom goes in the smallest vase in the front. See how the sizes get taller as they go further back? These are all roses, but different types and colors of roses. The colors and intensity of hue should all complement each other. 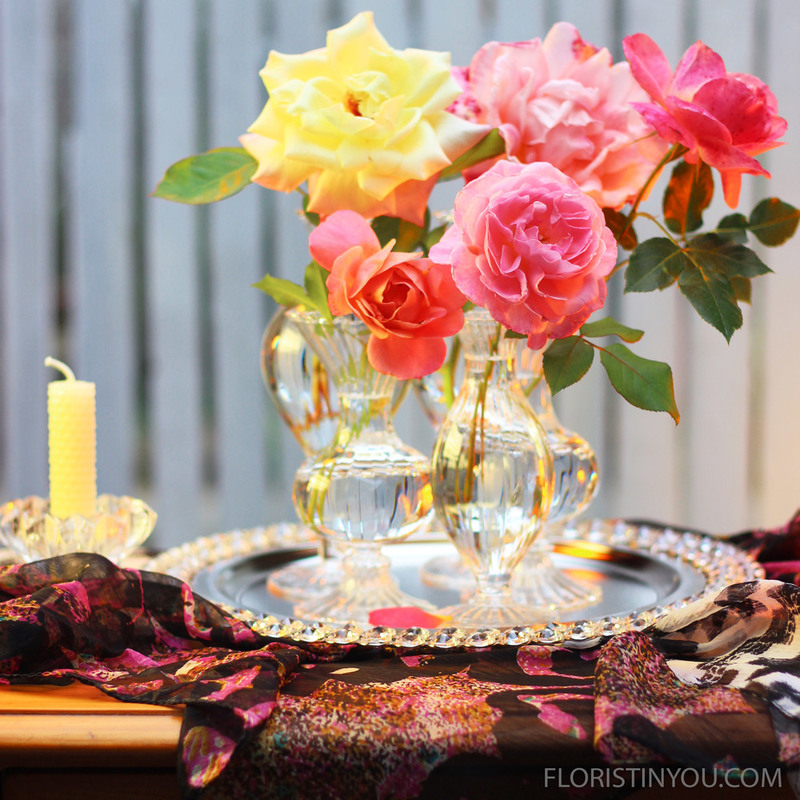 We'll put out a candle and it's the perfect table setting for a party...just watch out for that "Mad Hatter".